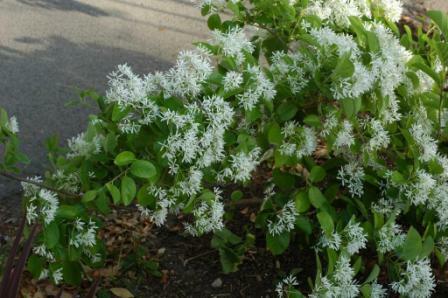 NATURAL HABITAT AND PREFERRED SITE: Fringe tree likes the deep rich sandy acid soil conditions of east Texas but will grow fairly well in soil with a neutral pH such as Houston. It prefers dappled shade and is often seen growing on the edges of forests. 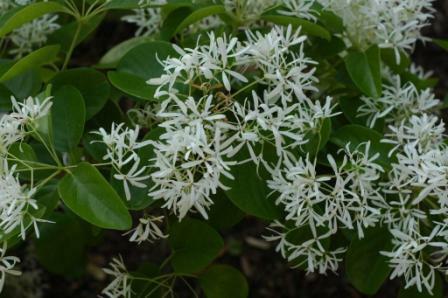 CULTURE: Fringe tree is only adapted to sandy, acid soils like that in east Texas and will not adapt to the alkaline soils well at all. It likes moist soil and relatively high fertility. PROBLEMS: Pest problems are minimal. Not adapted to alkaline soils, will be in stress and have insect and disease problems. Few if any problems if the tree is planted in the proper locations. Occasionally has spider mites due to stress. INSIGHT: The fringe tree is considered deciduous but the leaves are persistent in the winter in the Gulf coast area. In most of the state the foliage turns a bright clear yellow and falls.